Lets start the year with a real blast, shall we? 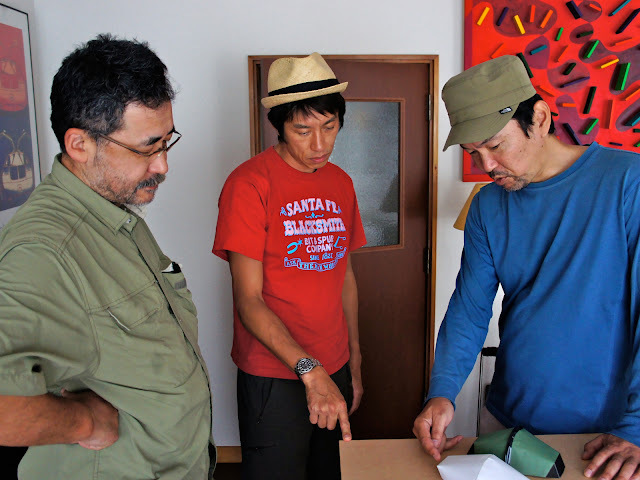 I'm honored to be able to introduce you today to Jotaro Yoshida, the owner of LOCUS GEAR from Japan. His cottage company exists now for a bit over a year, and it is thus time to sit down and have a chat with Jotaro. Help yourself to some wagashi and tea and enjoy! Jotaro in front of the Apollo Shelter. Jotaro, please briefly introduce yourself and tell us who you are. Since when are you backpacking, and how did you start? How often are you outdoors on a trip nowadays? I was born in Kyoto, which is close to the river and wild fields. The environment as my playground raised me wildly. Since I was a little kid, I love to explore to find something mysterious, like the giant beetles in the fields and mountains. Not only by day but also all through the night with a small backpack, sleeping outside without any shelters and sleeping bag in the summer. And sometimes I went to dive in the river which is forbidden to swim. I remember I was a crazy kid who could not stop finding something straight away if I really wanted. And the sense is never changed, I guess. Then, as I grew up and finished University, I became a businessman - until my early thirties. I had almost killed myself to stick in the area busily. I set up my own company with my partner that was for Computer Graphics and web design etc. However, maybe, my instinct was screaming "This is too much". So that the big turning point of my life came and I moved to Tokyo from Osaka. Some new friends I met in the new field took me back to nature. I started surfing and hiking. And nowadays I mostly like hiking, as much as I have time I go out not only far mountains but also near the area where I live now. I think I am a lightweight backpacker rather than “UL”. My baseweight is about 6kg. It depends on when, where and how long I go. Please tell us where the name "Locus Gear" comes from, and what it stands for. A few years ago, I heard the word [locus] by chance, when some friend used the word [locus] about the thing which some complex constructs should be transferred and re-constructed precisely you must dismantle once before. When I started making shelters I remembered it and fit with me. Also the meaning includes [loc-us] sounds good to me. Mr. ULG, Glen Van Peski and Jotaro at Mt. Kobushi hut in the Chichibu range. Locus Gear makes innovative lightweight shelters and tarps, and offers useful accessories for UL backpackers. Can you tell us how the idea to start the company emerged, if it was easy to quit your previous job and how you see the future of the company? I must tell you at first I really like to make something with my own hands even while I was doing my computing job. I am quite familiar with three-dimensional objects since my early age. The most attractive one is pyramid, so, I studied them for a long time. That study is one of my life work, too. About my previous career, I strongly believe that nothing is wasted. Everything is connected into me. For example why I can use CAD and web software? This is because from my previous experience. And why I love Pyramid so much so long? I think, in my age, all experiences you made even look like the waste and/or mistake are just continuing career for everyone. And you will never know when it helps you by the time. At the LOCUS GEAR workbench. You offer some very innovative gear, like the Khafra and Apollo shelters - can you tell us a bit how you went about the design process of these two shelters, and where the inspiration came from? I think the answer is already the above. In addition, the shape like Apollo and Khafra is the basis , simple, strong and the rules of the nature. So, I had no idea not to make my shelters like it. Some comments I have heard about the Khufu shelter were that it looks very similar to the Mountain Laurels Design DuoMid. What is your response to such comments? My honest opinion is “Why only DuoMid and ours?” I actually never see DuoMid except some pictures. I guess there will become more shelters like it if only more people realize it’s really functional. 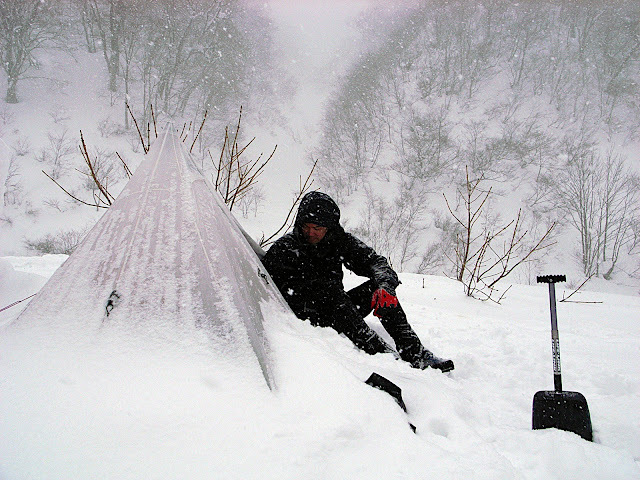 Camping in the deep snow at Minakami with the Khufu Cuben. Jotaro, we love to be let in on the work-in-progress stuff! Can you let us know what kind of new products you're working on at the moment? Well, I feel like spilling my beans, however, there are some confidential projects. So I tell you a bit. 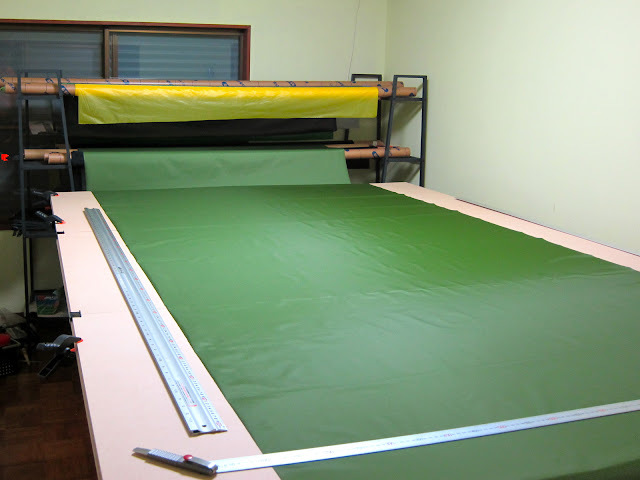 Now we are making new SilNylon color fabric for 2011 version. And by spring, Locus Gear special edition Apollo with high end fabric will be selling in the popular magazine in Japan. 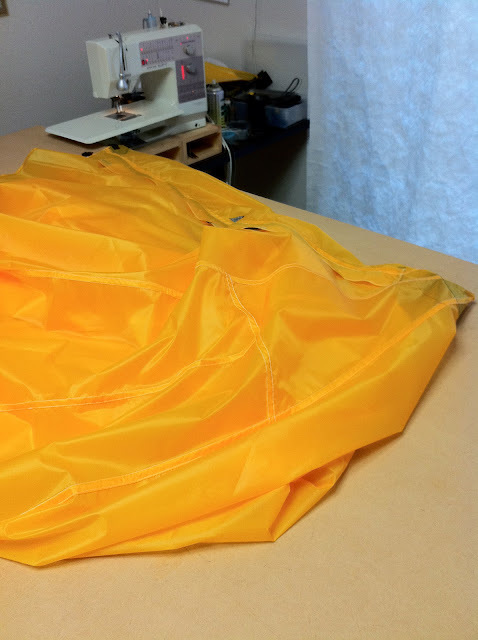 Also, the most lightweight breathable Khufu (this is still prototype) will be shown in a few months. Then I really want to release Bivy (hopefully with eVent fabric) and special Backpack collabo. Version. This is my subject for 2011. There are some offers to work with us and custom requests gaining day by day. We must focus on, and deal with carefully one by one. It takes time. How works the R&D at Locus Gear, do you have a need yourself that you try to fix, or do some of your clients inspire you for new products and ask you for solutions to their problems? I am always thinking there is something I should improve. And many ideas are coming from my companies and clients by e-mail and/or Twitter. I check the voices every time. What is the Locus Gear bestseller, and where do your customer come from? Our customers are mainly domestic. But there is quite a lot of contact from outside, though I think Yen is too strong now. U-m, about sales there is not only one win. Our customers choose with their needs and style. For myself it is in the middle of progressing, it means always new is the best. And I would like to mention I am trying to sell our products worldwide. So that our web shop site will be revised. 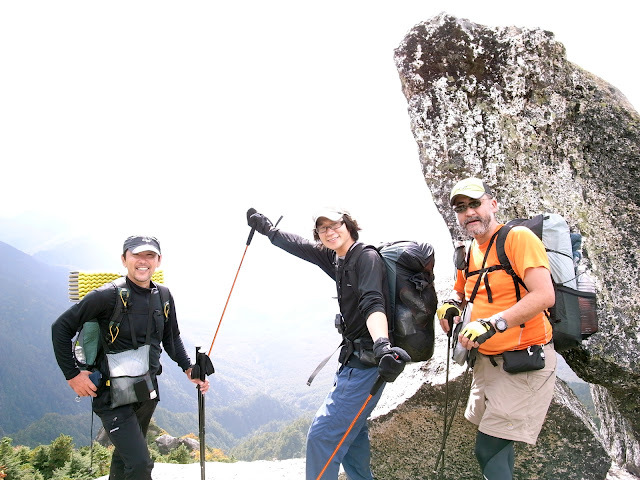 Jotaro, Mr. Chiyochang (Moonlight-Gear) and Mr. ULG at the Chichibu range. Are you in touch with other cottage manufacturers in Japan, the USA, Europe or other places? Not so many. Not so many like us in Japan, either. Glen Van Peski visited Japan not too long ago, what kind of experience was that? This was a great meeting and hiking together for several days with having a really good time. I have got inspired by his philosophy and action. We keep in touch since then. Mr. Yasulow, Mr. Tsuchiya, Jotaro, Glen Van Peski, Mr. ULG and Mr. BMP in the Chichibu range. I know that Japan has a bustling UL backpacking community, there is a couple brick & mortar UL stores, UL online stores, your cottage business and a growing number of UL backpackers. How did that community come to be, and what can you tell us about it? Well now the outdoor action is booming and becomes fashion in Japan. To me UL is not just about the weight but also the experience and the skill of the person. If you are very beginner, I do not persuade to reduce your packing weight at first. About business growth of UL, I can only say that “I hope so”. However, I feel the communication and the relations between UL hikers are surely tying. They are always sharing information and the experience to help each other. This is one of the good things. My favorite backpacks are a Gossamer Gear Prototype (G5?) Pack, the GraniteGear Vapor Trail and the ULA CDT. My favorite sleeping system is a Therm-a-Rest Z-lite & Pro-lite (in winter), a Therm-a-Rest Trekker Pillowcase, Marmot Lithium or Mont-bell ULSSDH#2 and a Tyvek Bivy. 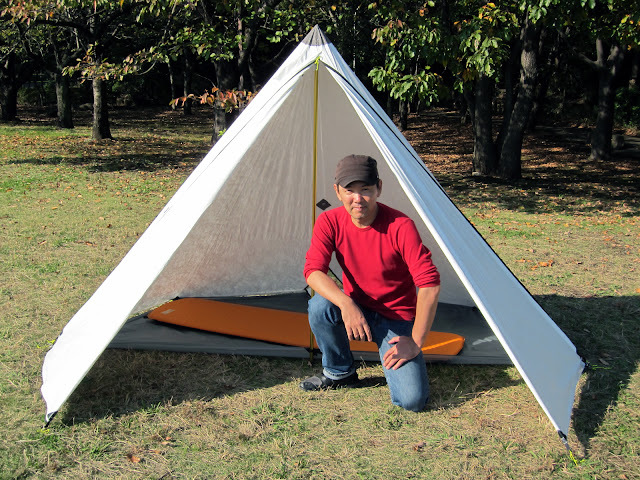 My favorite shelter is the LocusGear Khufu Cuben. Another favourite piece of gear which I always carry are the LocusGear Carbonfiber Trekking poles. And I love Inov8 shoes. Mr. Beyondx and Jotaro at the Oodarumi hut in the Chichibu range. Before I started LocusGear, I went hiking for about 2 weeks for testing our products. Since then I really have no time to go out so long 5 or 6 days at the longest even I go somewhere every month. This first year for us was very busy and rush every day like a hurricane move. However, we are getting used to how we should run, so I want to go somewhere longer, maybe the Himalayas next year. I am sure that I will sleep in the deep snow this winter again. The technology is definitely progressing and the gear is automatically becoming lighter because of this reason. In the near future there will be no border and difference between UL hiker and other backpacker, so that I think the business is expanding widely. Snowshoeing in the deep snow at Minakami. Jotaro, ありがとう (domo arigato) for taking the time to answer my questions =) Is there something you would like to add? I really appreciate to give me this opportunity to tell you about what I think and feel. We are just a baby to start walking with many warm eyes. Day by day I find that someone in/from somewhere in this world is interested in us, mentioning about us, and contacting us. This is the most wonderful moment, as a small gear manufacture and a person, I can feel connecting with you. Thank you so much.